The case is a test of the strength of the new law, which was hastily passed in the wake of the attacks. THE battle over insurance coverage of the World Trade Center took another twist yesterday when Larry A. Silverstein, the developer who won the lease of the trade center in July, sued Ace Bermuda Insurance Ltd. and XL Insurance Ltd., two Bermuda companies that covered the complex. The suit seeks to compel them to litigate any dispute over payments in federal court in Manhattan. According to Mr. Silverstein's suit, filed in federal court in Manhattan, the two companies are trying to have any dispute over the amount they owe decided by a private arbitration panel in London rather than by a United States court. 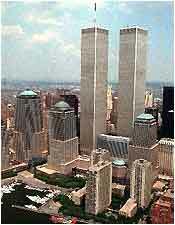 Mr. Silverstein, through his lawyers at Wachtell, Lipton, Rosen & Katz, contends that recently passed federal legislation makes Manhattan's federal courthouse the exclusive forum for resolving claims related to the Sept. 11 attacks, regardless of the language of any contract in particular. The location of legal proceedings is important because Mr. Silverstein may receive a more favorable hearing in New York, and because a decision there would most likely bind several or all the insurance firms involved. The case is a test of the strength of the new law, which was hastily passed in the wake of the attacks. The outcome matters not only because Mr. Silverstein and his fellow investors will soon need money to continue to make mortgage payments to their lenders and lease payments to the Port Authority of New York and New Jersey, which owns the trade center site, but also because he hopes to rebuild the complex. Yesterday's filing comes after a lawsuit filed last month by another of Mr. Silverstein's insurers, the Swiss Reinsurance Company, which is trying to limit its liability. The company disputes Mr. Silverstein's contention that the attacks on the two towers were two distinct events entitling him to claim the full amount of insurance coverage -- $3.5 billion -- for the collapse of each building, or a total of $7 billion.